Government is coercion. It is one characteristic of government – local, national, multilateral – that is not found in other private and voluntary institutions. And since government has the monopoly of force, legal, political and armed force, it tends to force its way to the detriment of individual liberty. Forecasting climate and making stringent environmental, energy and taxation policies to “fight man-made warming and climate change” and to “save the planet” are major areas where government coercion is becoming clearer. The UN Framework Convention on Climate Change (UN FCCC) COP 16 meeting will start next week in Cancun, Mexico. The collapse of the COP 15 meeting in Copenhagen last year, which experienced a bitter blizzard for an event to “fight global warming”, was bad for the thousands of climate bureaucrats around the world. So this time, they want to see some “concrete results” of drastic carbon emission cuts from the rich countries, several hundred billion dollars in climate money transfer from the rich to the poorer countries, and various schemes of global ecological central planning. How will they do that? United Nations leaders will demand ‘concrete results’ from the looming Cancun climate summit as global warming is accelerating, a top UN organizer of the event said Monday. Robert Orr, UN under secretary general for planning, said the next Intergovernmental Panel on Climate Change report on global warming will be much worse than the last one. They are referring to the UN IPCC 5th Assessment Report (AR5) that will come out in the next few years. The IPCC AR4 was released in November 2007. Take note of the warning, “much worse than the last one.” Wow! The conclusion has already been made – ahead of the “scientific” findings that will follow a few years from now. This is similar to the IPCC AR4. The “Summary for Policy Makers” (SPM) was released in February 2007 while the actual and main report, the IPCC AR4, was released in November 2007. The conclusion and recommendations came ahead of the actual report! 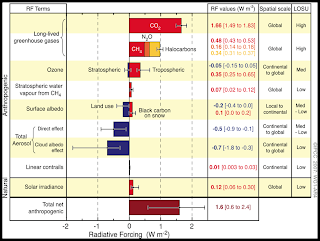 And just how bad was the last one – the IPCC AR4? Below is a table from that report. 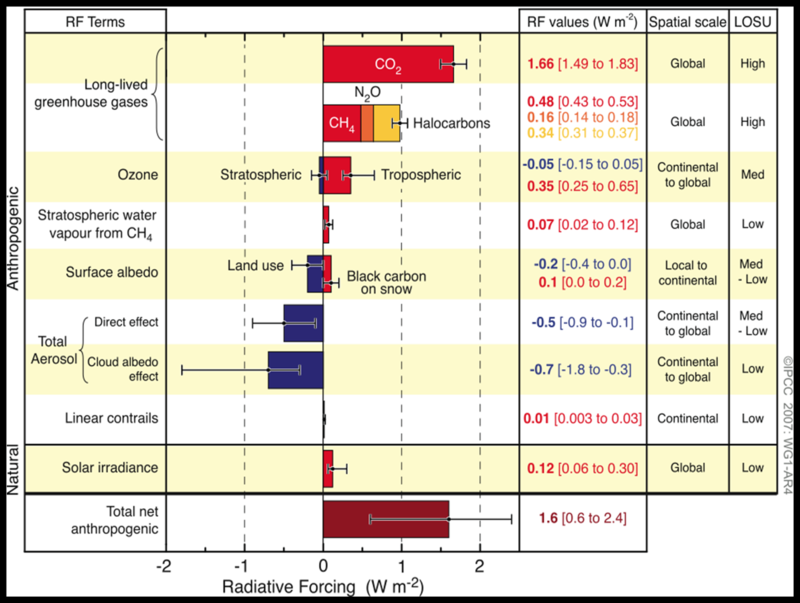 Estimated radiative forcing from all sources that contributed to global warming in the past. Of the nine factors identified by the IPCC, eight were anthropogenic or caused by man, while only one was natural, the Sun. The estimated solar forcing was insignificant, only about 0.12 watts per square meter, versus 1.6 watts per square meter for anthropogenic sources. Ask the IPCC scientists: Why a minuscule solar forcing? What about clouds and water vapor, the oceans (Pacific Decadal Oscillation or PDO and Atlantic Multidecadal Oscillation or AMO), volcanoes, the galactic cosmic rays (GCRs) from exploding stars in the universe, the jet stream, and other natural factors? Mt. Pinatubo’s eruption in 1991 alone contributed to global cooling by up to 0.4 C until 1993. The world’s climate has been on a cycle, warming-cooling-warming-cooling. Global warming is true, it happened in the past; the same way that global cooling is also true, it happened in the past – and is happening now. 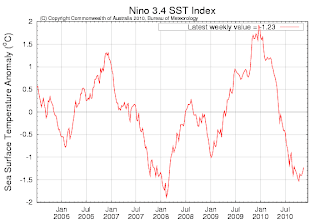 See for instance the latest sea surface temperature (SST) anomaly (or “deviation from the average”) for Nino region 3.4, the largest region in the Pacific Ocean, as of November 21, 2010. 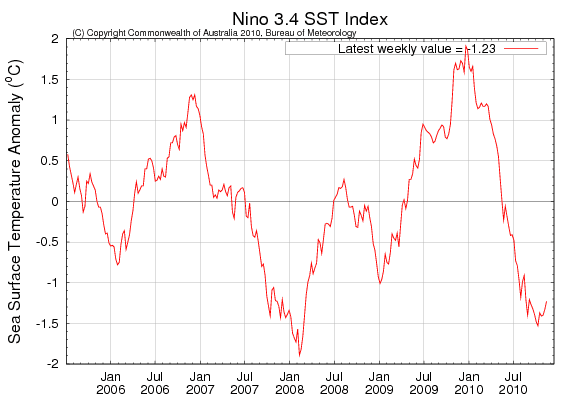 Data gathered from http://www.bom.gov.au/climate/enso/indices.html. The IPCC remains true to its color. It is not a scientific body – rather, it is a government and politicial body. That is why it is called “intergovernmental panel” That is why the head of IPCC, Mr. Pachauri, is not a scientist but an economist. That is why the IPCC and Al Gore the politician almost always have the same messages of climate alarmism and the need for more environmental regulations, more carbon and energy taxation, more climate bureaucracies and more global climate meetings. Government is coercion. Political science, more than climate science, dictate climate and environmental policies. Their notorious political agenda will proceed. As the Northern Hemisphere is shivering with severe cold, as the Philippines and other tropical countries are mired in daily cloudy skies and occasional heavy rains and flooding, we are made to believe that these are still evidence of “man-made warming and climate change.” Heads they win, Tails we lose.